Kevin Plank seems dedicated to showing off his Baltimore bona-fides. He is building replica crabbing boats to ferry tourists around the harbor. He’s restoring Maryland’s straight-rye whiskey tradition at his South Baltimore distillery. And he’s proposing a sprawling state-of-the-art community on the Patapsco River’s Middle Branch. 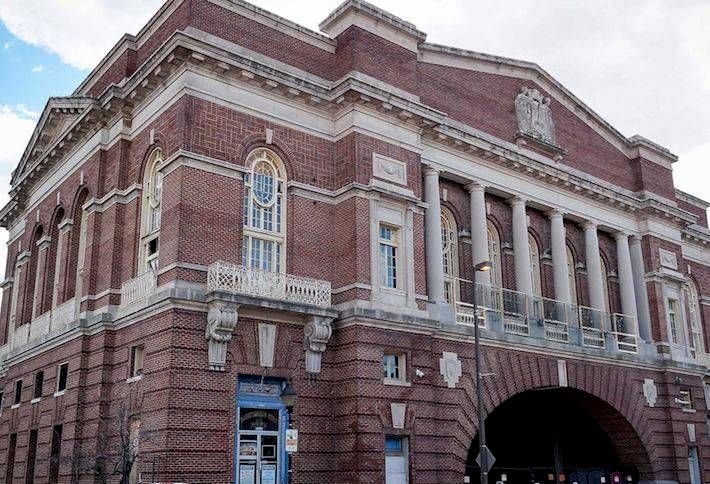 Two years ago, when Kevin’s brother, Scott Plank, announced at a meeting of the Fells Point Main Street plans for a chic hotel inside the old Rec Center, I suggested that he include a historian who could teach its history to employees. Without a moment’s hesitation, he dismissed my idea. Fast forward to February 2017, a month before the hotel’s opening, when I told Sagamore Pendry’s general manager of my fear that employees would tell tall tales about the building and its alleged origin as the processing station for immigrants coming to America. He referred me to the guest services manager who said he didn’t have time to speak to me for several months. 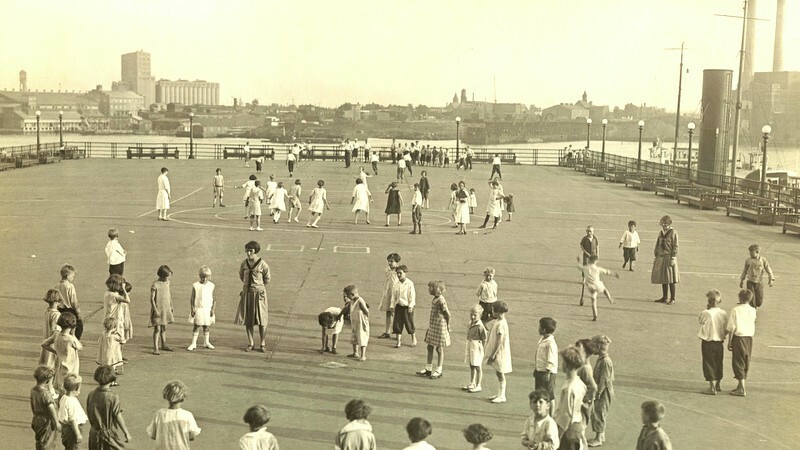 Baltimore City opened the Recreation Pier in 1914 so that citizens living at the foot of Broadway had someplace to go for fun. Their houses were tiny and families were large, with 8, 10 or more children. The men’s jobs as stevedores and the women’s in canneries were brutal, 6 or 7 days a week. Aside from work and church, there was little to do. The Rec Center had lots of room for parents to relax and kids to play games. And the city got income by renting out the surrounding dock for commercial purposes. When March 2017 arrived and the Sagamore Pendry opened, I began asking its employees what they knew about the building. They were happy to tell me that the Rec Center was the first view of America by millions of immigrants coming from Europe. Since the building contained a lovely ballroom, I could picture (from their eager descriptions) what the immigrants did when they arrived in America. They danced. After their long passage across the ocean, one could imagine the unfurling of tuxedos and petticoats from the duffel bags and wicker baskets of the dispossessed, who then waltzed to the sounds of cannery whistles and ship horns. My revelry ended when I recalled this inconvenient fact – World War I began the same year that the Rec Center opened and immigration to America slowed to a crawl. The place where immigrants did disembark from Europe between the 1860s and 1914 was the Locust Point piers owned by the Baltimore & Ohio Railroad. 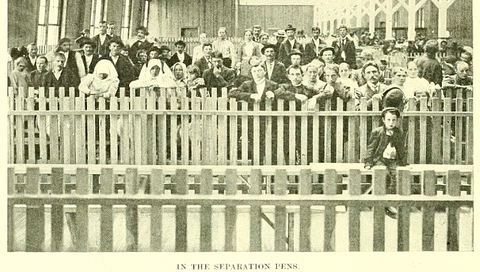 Above is a photo of a little boy sitting alone amid the “segregation pens” at Pier 9 around 1904. 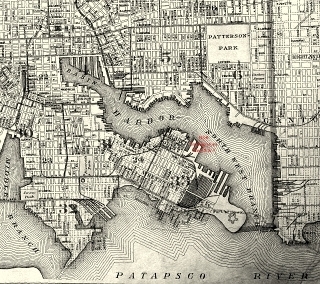 Below, Bromley’s 1906 Atlas shows the two immigrant piers in red. Note the absence of the Rec Pier across the harbor. It wouldn’t open until 1914. Fells Point is full of invented stories. They hide in between the old bricks, waiting to ambush some newcomer who knows nothing about the area. His call wasn’t made to correct the record, but to shame and silence this voice. At least for now, the immigrant mythology continues to flourish. Last Friday, I struck up a conversation with two women who were getting into a car with Virginia tags. They had come to Baltimore to stay at the Sagamore Pendry. The woman who identified herself as a schoolteacher told me what she had learned from the front-desk employees. She seemed pleased as punch to be part of this history. – For 35 years, ZIPPY LARSON has conducted award-winning “behind the scenes” tours of Baltimore.